Interesting – ARP praises the creation of musical textures “new to this world”. 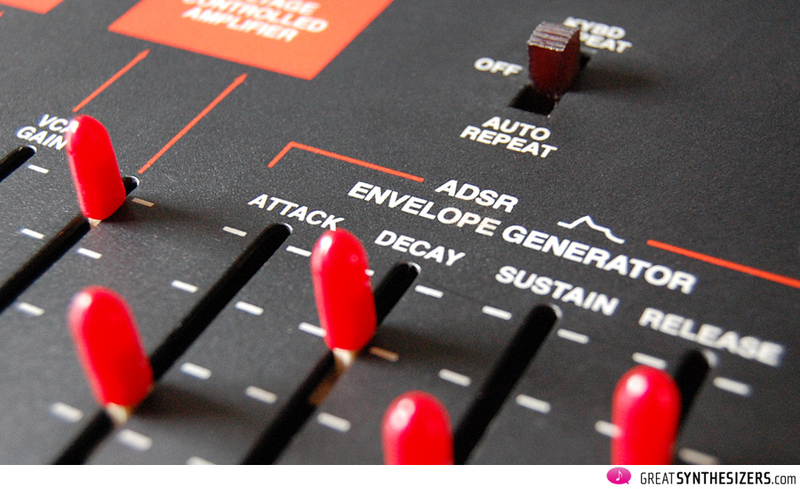 So what do you actually need the ARP-2600 for … ? 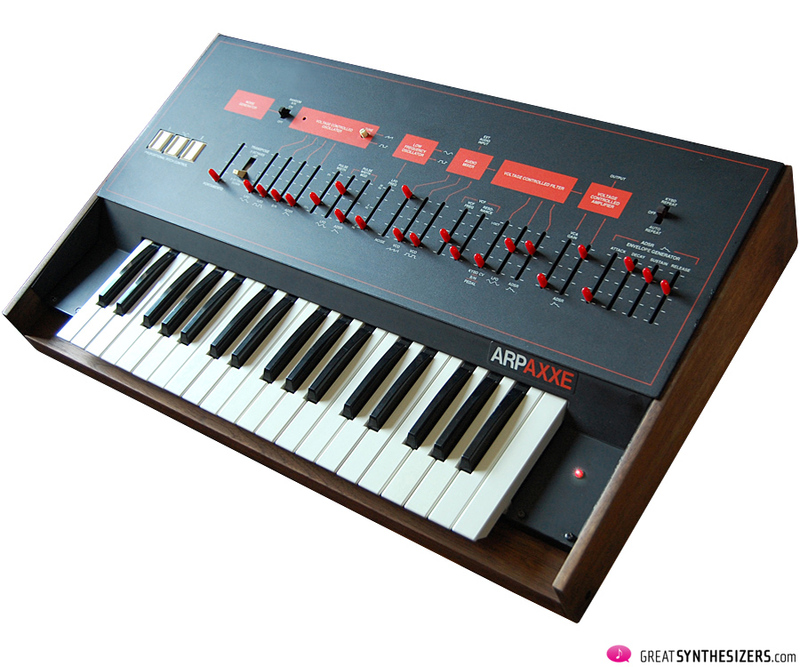 As a cut-down version of ARP’s successful Odyssey, the Axxe hit the market in 1975. It only features one VCO (admittedly a very nice one) and has reduced modulation possibilities. 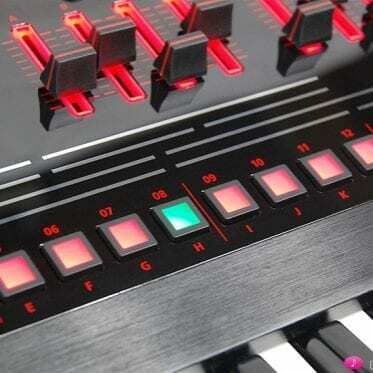 Compared to other companies ARPs release of its smallest synthesizer came very early. Moog did bring out the Micromoog at the same time, but that instrument was no success at all. 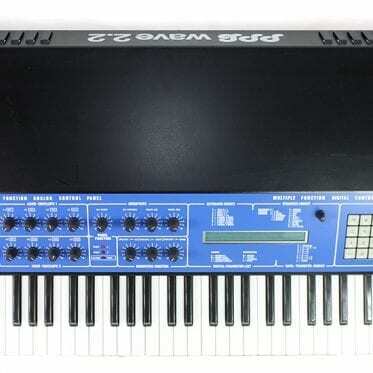 Highly successful cut-down synthesizers were released a couple of years later – like the Prodigy (1979) and the Rogue (1981). Sequentials Pro-One and Oberheims OB-1 were not out yet, but these instruments can hardly be seen as cut-downs. They are single products in every respect. People might tend to look at the Axxe as second-rate. But be careful there: although the features are limited, the sound is truely ARP high quality analog sound! Sonically, the Axxe is actually not too far away from the 2600, Odyssey and Avatar! Power and flexibility may be somewhat greater on the state-of-the-art 2600, but still: the Axxe is a lovely ARP synthesizer in its own. Admittedly, neither the Axxe nor this list is especially impressive. 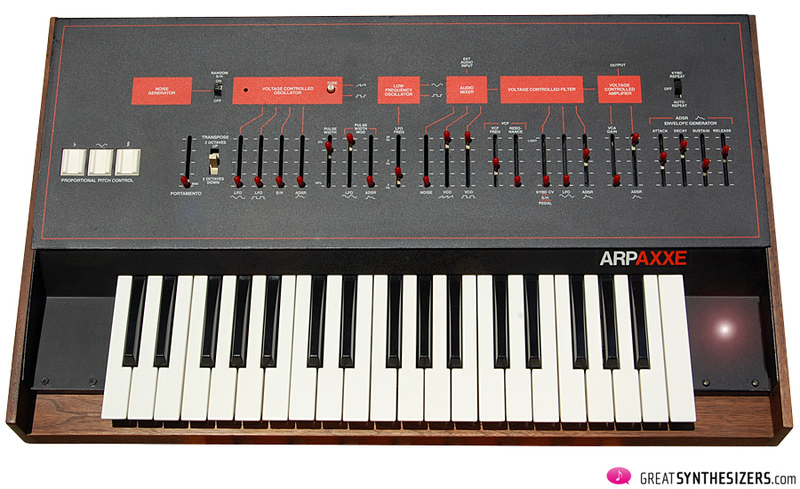 But taking into consideration its reduced possibilities, the ARP Axxe remains one of the biggest surprises in synthesizer history. A cut-back synthesizer of these dimensions, well arranged and (surprisingly) capable of real music is a rare thing in the land of vintage monophonics. 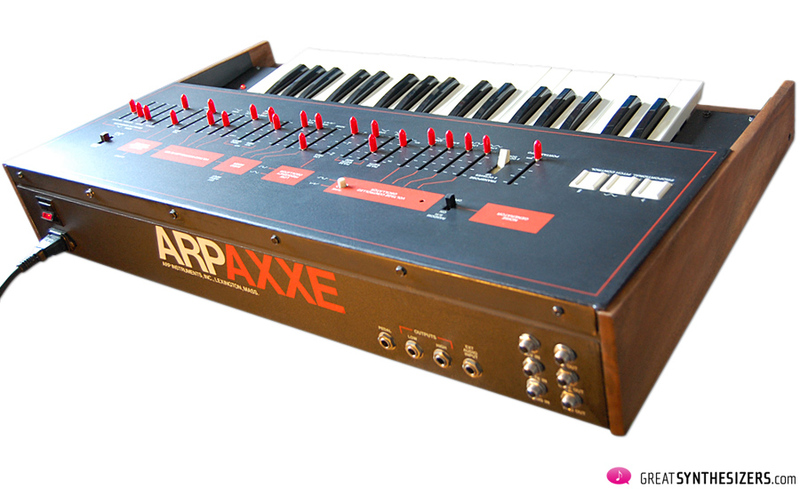 There are two versions of ARP Axxe. The early one (MK I) is very compact with golden lettering, wooden side panels and either a pitchbend knob or a single PPC pad. 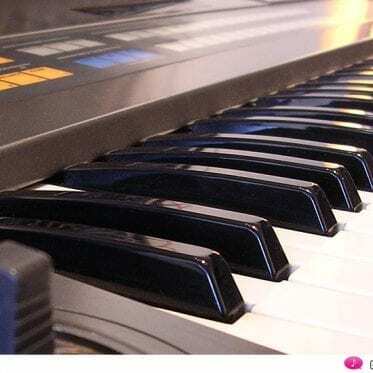 The second version (MKII) has been modified to the general ARP production series since about 1978 and totes orange lettering, leather end-cheeks, overhanging keys and the PPC pads. The advantage of the second version is the unbelievably expressive PPCs which will be discussed further below. You shouldn’t do without these! 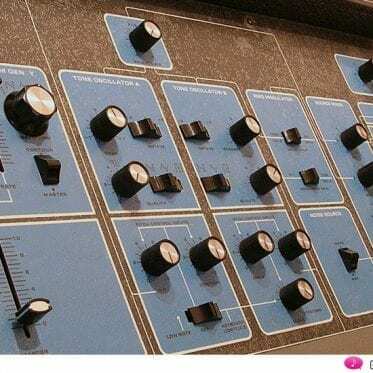 On the other hand, the big disadvantage of the second version is that overhanging keyboard, which was probably also a source of confusion by the users of the ARP Odyssey MKIII and ARP Quadra. (Then and now). 30 years later, clever technicians have solved this keyboard problem. 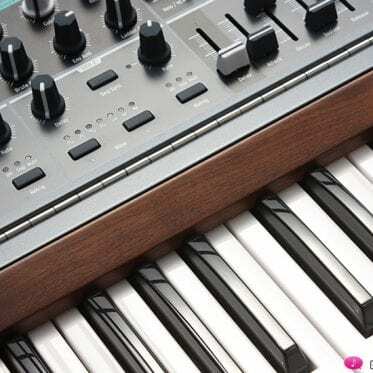 Synthwood.com, for example, has come up with a lot of solutions for various synthesizer cabinets. 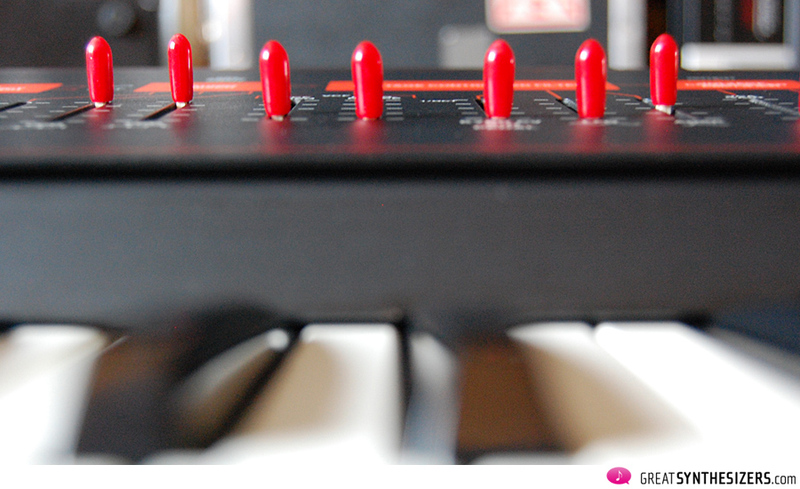 This also applies to the ARP Axxe, which I myself enhanced with components from Synthwood. Now, the Axxe keyboard lies protected within the chassis, which also – how else could it be – adds to its appearence. Recommendable. 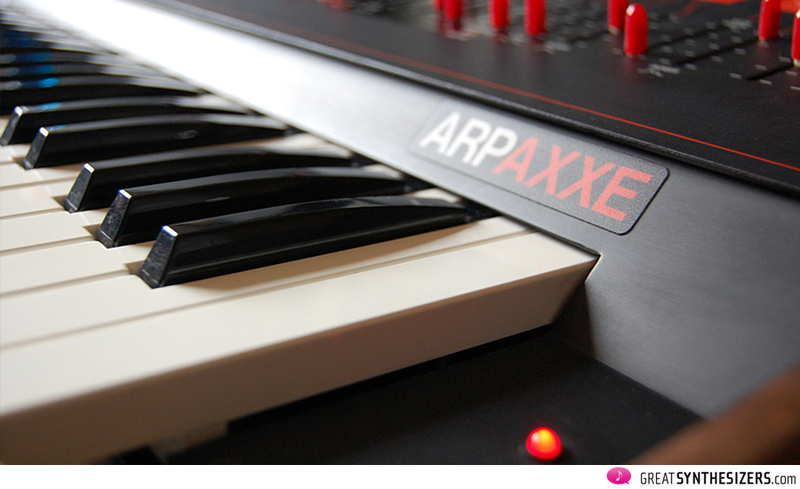 Slider tops are also a notorious problem with the later ARP Axxe series. The plastic tops of the illustrated Axxe have been replaced with rubber slider tops. So … with a little initiative, problems like this can be easily solved. What if the key doesn’t fit the lock? Well, if the Axxe is the lock, and the PPC-pads are the key, it might be easier changing the key. 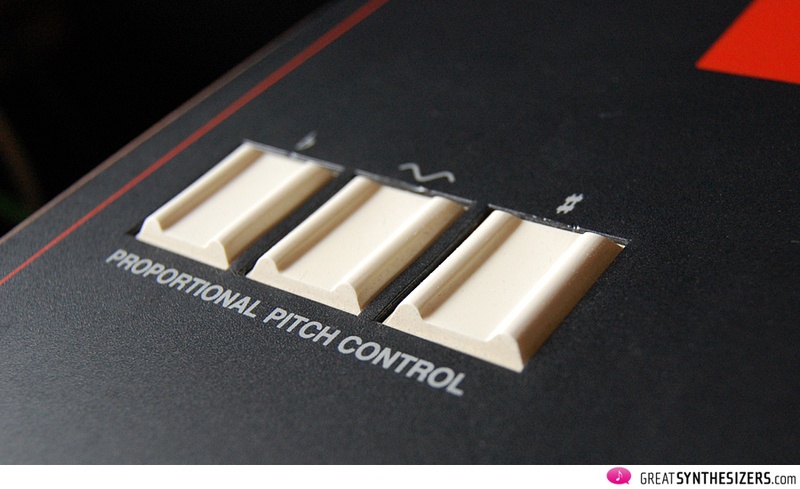 ARP developed the beautiful Proportional Pad Controls (PPC), but Axxe’s early version had no room for it! The original pitch bend knob fit perfectly, but those rubber pads ..? Demand for those nice PPCs might have been high, since they were implemented not only in some Odyssey II and all Odyssey III, but also in some 3620-keyboards as well. So the ARP people must have searched for a solution for the original Axxe. They found a simple but brilliant way to implement the PPCs: they reduced three pads to one, and supplied the single PPC with a little switch to enable a choice between the different functions. This is seen in some MKI versions. Nice. 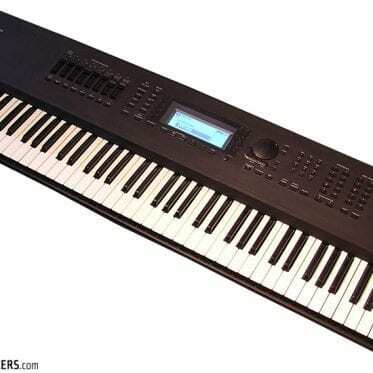 Further, the Axxe offers portamento and that typical transpose switch “2 octaves up/down”. The later orange Axxe version (from 1978 on) was wider and had enough room for all three PPCs … this version might be the one to look out for! It’s the one shown in our review. The single oscillator offers saw and pulse. Both waveforms may be used at the same time, so you end up with a sort of dual-VCO feeling. Modulation possibilities are quite good: LFO (sine, pulse), S/H, ADSR. 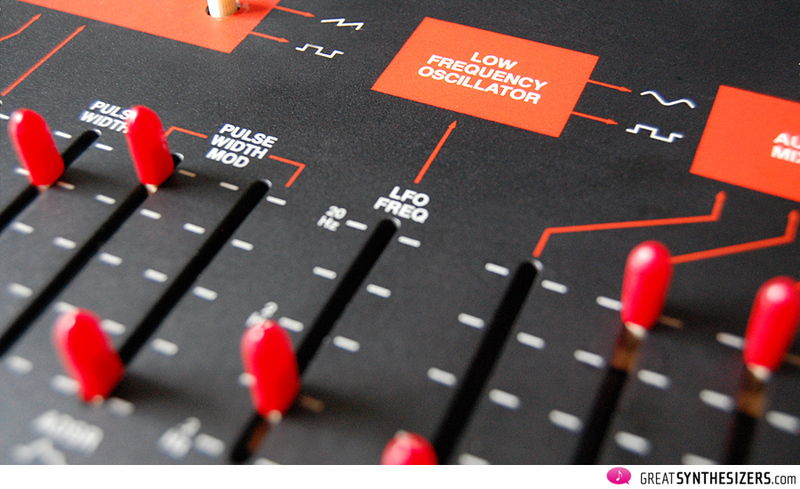 Pulse width can be controlled via LFO or ADSR. The filter is of high quality and is the equivalent of an Odyssey (MKIII, I guess). Its modulation possibilities are a little bit limited: three sources are offered at the same time (KBD CV or S/H or pedal, LFO, ADSR). Controlling the cutoff frequency via an external signal is tremendously important! Listen to the soundfiles – many of them are created with external LFOs (or other stuff) controlling the filter. 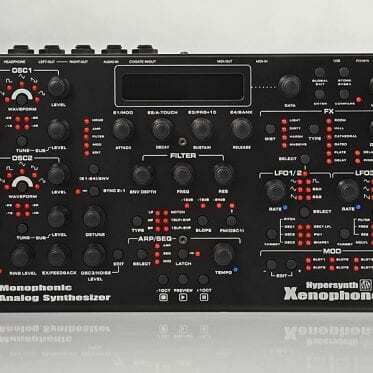 Especially high-frequency LFOs are nice to use (like Korg’s PS-3100 main LFO) – they allow you to bring out those brilliant vocal-sounds only ARP instruments can produce. Beside saw and pulse, there’s one more signal source: noise. Not unbelievably important, but it’s really useful for nice hi-hat- and snaredrum-effects. 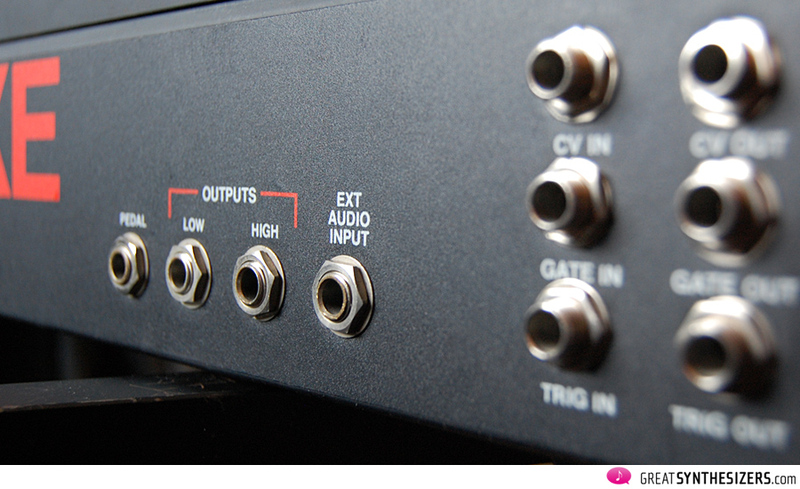 Further, you can run an external audio source through the Axxe. So, all together, the Axxe isn’t really missing very much. There’s one envelope. Not too much, but sometimes it’s definitely better having less possibilities – at least, that’s my experience. Good music is not a product of tons of features. I remember well being confused all the time while working on Yamaha’s extraordinary CS-30. 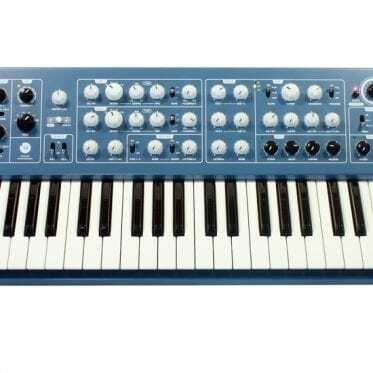 A lovely synth with heaps of features, but still, I had no chance to feel creative with it. (“Envelope 1 and 2 can be positive or negative, envelope 3 is positive only. So, ENV1 pos is called A, neg is B, ENV2 pos is C and its negative output D, finally ENV3 is E. Please remember all those letters!”). If the head is filled with technical aspects, the music gets totally lost. I prefer the simple things. I prefer the Axxe. Very good interfacing: CV/gate/trig IN and OUT. Audio-out Low and Audio-out High. Last but not least: audio-IN and pedal (controlling the filter). Nice ARP-sound. Equivalent to the Odyssey, sometimes to the 2600. What you get are good bass-sounds, strong leadsounds full of character (thanks to the PPCs), surprising fx-sounds (thanks to the pedal-port and to such external modulation sources as high-rate LFOs or analog sequencers). Certainly there are sonical limitations. Crossmodulation can’t be effected with one VCO, neither can ringmodulation. 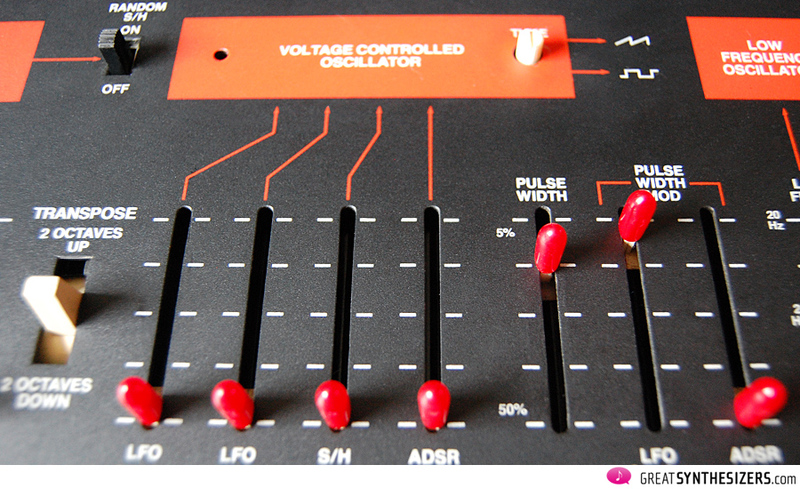 The same goes for some special sound creations easily done on the ARP-2600. 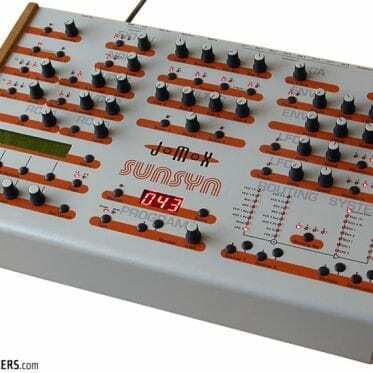 But look, this is a small synthesizer! Therefore it sounds superb! It may be of limited concept, but it has much of the beautiful and vivid sound potential characteristic of all ARP-instruments. An Axxe in respectable technical condition is an instrument meant to be taken seriously! The later (orange) version Axxe MKII is even more useful because it features all three PPCs. 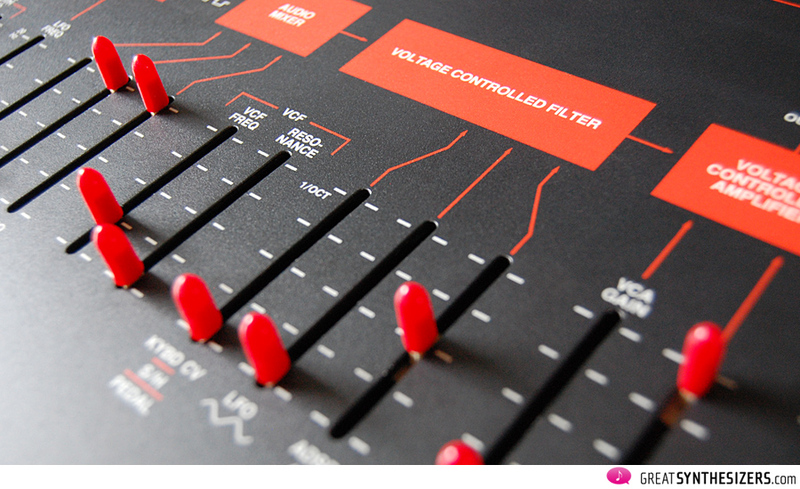 Anyone looking for an ARP to complete his studio-setup should have a look at the Axxe! Despite its small size, its sonical power is impressive. 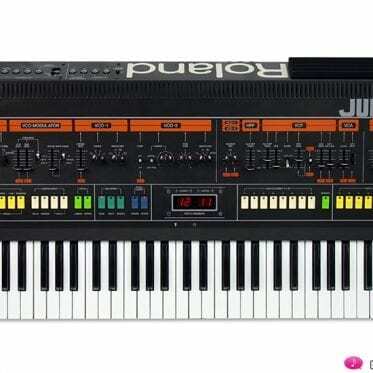 If weird modulation possibilities and strange sound creations are yours, the 2600 or Odyssey might fit the bill. But if you just love having a vast variety of ARP sounds at your fingertips, without having to get too deeply into complex sound creations, the Axxe might even become your favourite synthesizer!